When I got the Acer CRW 2010A CD-RW drive which I review at interminable length here, Aus PC Market also pressed upon me this item. 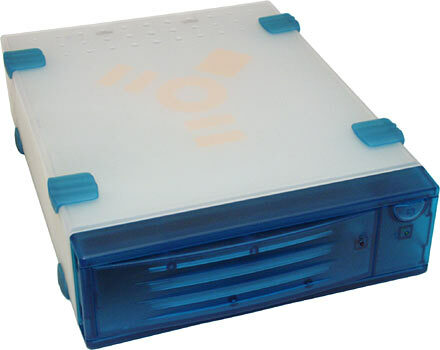 The Skymaster Skycase DEL-0551 is an external IEEE-1394 (FireWire) drive box, like the smaller one I talk about here. Both boxes are Skymaster products, and there's a strong family resemblance. See-through plastic exterior, steel interior. The smaller box is for 3.5 inch drives, and it costs $AU280.50 delivered from Aus PC Market, now. This bigger box can take take hard drives, too, but it's made for 5.25 inch devices. CD-ROM drives, DVD-ROM drives and CD burners, basically. It costs a mere $AU275, also including delivery within Australia. Both boxes do the same thing. They let you take an IDE device and turn it into a FireWire one, by using "bridge" hardware that translates the one interface into the other. All you need is a computer with FireWire ports. Not many PCs come with them, but you can add them with a simple PCI card that now costs little more than $AU100, delivered. You have to use bridge hardware if you want to plug any normal drive into a FireWire cable, because there's still no such thing, as far as I know, as a native FireWire drive. No hard drives, no CD-ROM drives, no DVD-ROM drives. There are plenty of companies selling pre-built FireWire storage devices, but every one of them actually uses some other interface - pretty much always IDE - for the storage device itself, with bridge hardware to translate to and from IEEE-1394-ese. Some of these drives are apparently elegant enough that the bridge hardware's built into the drive controller board, and so at a glance you might think it was natively FireWire. But it isn't. There's an IDE controller as well. The main problem with bridge hardware is that it's not as fast as a native FireWire device could be. There's some good bridge hardware on the market today, with not much of a performance penalty, but you're not too likely to find it in a Taiwanese do-it-yourself external box like this one. Not yet, at least. So I was interested to see if the Acer CD-RW worked in the Skymaster box. With good quality blanks, this drive can burn a CD in less than six minutes, when it's connected via a normal IDE cable. How would it do over FireWire? Getting a drive into the Skycase is easy enough. 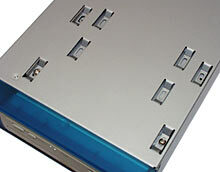 Sensibly, the box comes with no screws holding the slide-off plastic body in place, just two empty screw holes. All of the screws you'll need, including the ones for holding the box shut once you've put a drive in it, are provided in a little zip-lock bag. By default, the Skycase has a bezel installed in the front cutout, for people who want to use the thing with a non-removable-media drive. The bezel's not just a decorative dust excluder; it also contains a red drive activity LED that hooks up to the controller hardware at the back of the box. The Skymaster box has a plethora of mounting screw holes in the bottom of the metal inner box, and it should be easy to mount pretty much any IDE device in it. I found mounting a drive in the 3.5 inch Skymaster box rather tricky, but this bigger one was easy to work with. The cables end up slightly squished, but it's no big deal. The Acer drive was in, and the box reassembled, not more than ten minutes after I broke the seal on the Skymaster carton. Hooking the 1394 box up to a FireWire-equipped computer's easy enough. It's got two FireWire sockets on the back (so you can daisy-chain more devices) and an IEC connector for its power lead. It comes with a FireWire cable and an IEC lead. The big deal about FireWire storage is that it's plug and go. No driver disks, no rebooting, just connect it and start using it, and then unplug it whenever you want. A 1394 card can be installed in any Windows 98SE, ME or 2000 PC, and it'll Just Work. Well, almost. If you've got 98SE, you'll need to patch the standard 1394 driver with this file before a FireWire card will work properly. But if you've got WinME or Win2000, it's plug and go. I tried the 1394-ed Acer out first on a Windows 2000 computer, using Ahead Software's Nero as my CD writing software. At first, everything looked fine. Plug in the drive, and presto, the computer had a new CD-ROM drive, which worked perfectly normally. Windows thought the thing was a "FWIDE Shining ATA & ATAPI Devices IEEE 1394 SBP2 Device", but it could call it Humphrey for all I cared, as long as it worked. When I ran Nero, though, the computer locked solid. No response even to control-alt-delete. When I unplugged the Skycase, even as the Win2000 "Hey! you didn't Stop that device first!" warning came up, so did the Nero interface. Well, that was how it worked one time, anyway. Another time, Nero just crashed when I unplugged the 1394 box. No matter what I did, Nero couldn't see the 1394 drive as a CD writer if I plugged it in after Nero was running, and it couldn't start if the 1394 drive was already connected. The Nero CD Speed program (which is a CD Speed 2000 product) didn't see the 1394 drive, either. But at least it didn't hang on startup. OK. Maybe there was something funny about the Win2000 machine, or Nero. I transferred my IEEE-1394 card to a Win98 box, and installed Stomp Inc's Click'N Burn Pro, which they'd kindly provided for review along with the DiscSaver CD cases I review here. Herewith, a digression about Click'N Burn. If you just want to hear more about the Skymaster box, click here to jump past the software review. Click'N Burn Pro is one of the few boxed software packages that actually comes with enough stuff that there's a decent reason for putting it in a box. 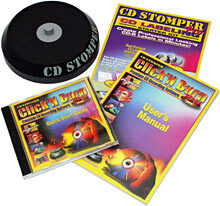 As well as the usual CD and manuals, you get a "CD Stomper Pro", which is Stomp's simple but handy CD labelling gizmo. It's basically just a rubber-based plastic doover with a spring-loaded spindle in the middle, but it genuinely does let you apply a label to a CD without any wrinkles and also, importantly, without getting the label slightly off-centre and thus creating a Magic Vibra-Disk that'll shake fast drives to death. I'm a scribble-a-name-on-it-with-a-marker kind of guy, but if you want to make pretty CDs, the Stomper will help. The label starter pack in the Click'N Burn Pro box gives you the Windows and Mac label-making software, and sufficient printable label sheets to do ten CDs. The label sheets have two CD labels per sheet, and four rectangular labels for other things, like floppies or Zip disks. You can order more labels from the CD Stomper site. Click'N Burn may not be an international mega-brand in the CD burning software world, but it's a good package. The reason why it's a good package is because it's a "Prassi clone" - one of a few CD authoring packages that are all built on the same "Primo CD" engine, made by European outfit Prassi. Sony's CD Extreme and Veritas' MyCD are Prassi clones too, and Prassi are now actually owned by Veritas. All of the Prassi clones are essentially just window-dressing on top of the Primo CD engine. By default, Click'N Burn Pro presents you with this interface when you run it, and the casual CD-R twiddler need bother with nothing more than the wizards you get by clicking the buttons here. I hadn't looked at Click'N Burn before, but I liked what I saw as I picked through the menus. Click'N Burn lets you make ordinary data and music CDs, of course. It also lets you do quick and easy CD copies, either on the fly - reading from one disc as you write to the other - or via an image file. Though, like all CD copying software, Click'N Burn can't do a true "block copy" like those old A Pirate's Life For Me floppy-copy packages used to do. The basic way in which CD-ROM technology works makes it difficult-to-impossible to make bit-for-bit copies of most "copy protected" CDs, essentially because the most popular copy protection schemes include deliberate data errors. If you try to read such a disc in the normal way, your reader will probably think there's something wrong with the sectors whose error correction information doesn't line up with the other bits, and keep trying over and over to read the data until something hits a timeout. That something may be the human waiting for the read operation to end. There exist CD copying programs that do "raw" reading of data from the disc, ignoring the error correction information. Which is all very well, and can make it possible to copy some deliberate-error discs, but only at the cost of not correcting any errors the reader happens to genuinely make. This is why certain nefarious sites do such a roaring trade in "CD cracks" for games that use various popular copy protection schemes. Click'N Burn can also make mixed mode and "CD Extra" CDs, with music and data on the one disc, and it can make VideoCDs if you give it suitable MPEG video files. You can put CD Text onto audio discs, too, if you've got a burner that can handle this sort of subcode stuff. CD Text doesn't do anything if a CD player doesn't understand it, but if the player does understand it, it'll display disc and track names - or whatever data you entered as the disc and track names. Click'N Burn can squirt data to up to four CD burners simultaneously, for people who need to make a pile of discs in a hurry. On a multi-burner computer, it can also record different CDs simultaneously - though good freakin' luck doing four parallel 20X burn operations. Certainly, if you want to verify the contents of four discs that all got their files from the same drive and all finished the write operation at about the same time, I would imagine you're about to visit Drive Flog Hell. Click'N Burn's "DJ Burn" feature lets you record audio live from your sound card line input straight to a CD, which is a nifty feature. You don't need much of a computer, by current standards, to manage on-the-fly 1X recording like this. DJ Burn lets the sound guy for a band start pumping out CD-Rs containing that night's performance before the audience can make it out of the venue. If you're a capacity freak, Click'N Burn will also let you "overburn" discs, writing data beyond the stated CD capacity. The standard lead-out space on a "74 minute" CD blank is enough for 90 seconds of digital silence, which is what's used to tell audio CD players that the record's over. That 90 seconds is on top of the 74 minutes, though, and if your CD burner supports it, you can write into that space. This may make strange changes to what a disc written in this way will do in an audio CD player, but there's, theoretically at least, more than 10Mb of extra space to be had. Click'N Burn Pro comes with some extra tools as well - a basic CD-to-WAV audio ripper, a CD image file maker, and diagnostic and "tune up" utilities. Click'N Burn Pro also, significantly, takes up less than 5Mb of drive space. Which is a bit of a revelation, in this era of applications bigger than the entire world's total magnetic storage in 1960. The current version of Nero, by the way, is about 19Mb by itself, or about 43Mb with its optional utilities. Software bloat aside, though, I don't think Nero loses to Click'N Burn in any major department, except perhaps value for money. Buy yourself Nero on CD from the Ahead Software site and you'll pay $US69 plus shipping. Then again, you can register the free-download version of Nero for $US49, which is a big 95 US cents cheaper than Click'N Burn Pro's direct retail price. Click'N Burn Pro gives you the CD Stomper Pro in the box, so if you want one of those, Click'N Burn is probably the better deal. There's no free demo of Click'N Burn, though. It's not a bad idea to download the evaluation version of Nero (it's 10.5Mb, so modem users don't need to be too frightened) before you drop any money on another Windows CD writing package. The demo version of Nero is time-limited, not crippled; all functions work, but they only work until the death-day of the demo rolls by. As I write this, the current version of the downloadable demo has only 10 days of life left before it'll refuse to run. Well, unless you reset your computer's clock, anyway. But when this demo expires, Ahead will put up a new one with a later expiration date. So it's perfectly possible, though rather underhanded, to just keep downloading the demos over and over and never pay Ahead a cent. If you've bought get a drive like the Acer CRW 2010A, which comes with the full version of Nero, there's no pressing reason to switch to Click'N Burn. Many other drives come with Roxio's Easy CD Creator (which used to be an Adaptec product until they spun off the new company, in case you're wondering about the "Roxio" brand...). That's OK, too. The CD Creator line used to be giant bloated packages that many people hated, but they work perfectly well now. Nero is a bit rude (I probably wouldn't think of it as Teutonic software if I didn't know that it was...), but its quirks are not horrible, and it's a full-featured package too. Why have I been chattering about Click'N Burn for all of this time? Well, partly because it's a perfectly good piece of software, and partly because the Skycased Acer drive didn't work right on the Win98 machine, either, so there's not a lot more to report in that department. Again, the thing worked OK as a CD-ROM drive - and Win98 identified it the same way it would have if the drive were plugged in via plain IDE, as "ATAPI CD-R/RW 20X10". That's what Win2000 calls the drive when it's connected via IDE, too. But when I ran Click'N Burn, whaddaya know, it hung. Click'N Burn didn't hang when I ran it if the writer was connected, but with no CD in it. But that wasn't much help, since it didn't recognise the existence of the drive, either, and putting a disc in would cause another hang. The drive worked just fine plugged into an IDE cable, but it worked only as a CD reader, not a CD writer, in the Skycase. I know that people have managed to install CD writers in external FireWire cases and got at least 4X writing out of them, and I don't think there's anything terribly wrong with this drive. It certainly works fine when connected directly to an IDE lead. But, clearly, something about this combination breaks it. If any readers have a clue about the hangs, feel free to tell me. 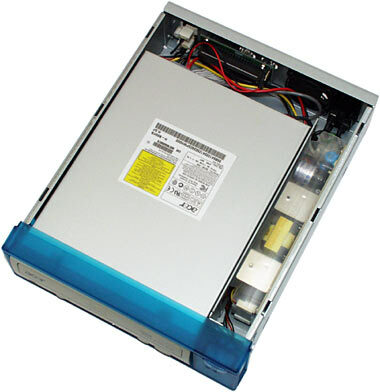 If you want an external FireWire CD-ROM drive, then by all means pick up the Skymaster DEL-0551 and a commodity IDE drive. The case is $AU275 delivered, and a decent CD-ROM drive will set you back less than $AU100, also delivered. That's about as cheap as you can expect a FireWire CD-ROM drive to be. There are various slimline FireWire CD-ROMs available, but they all still seem to cost well over $US200, ex shipping. Landed in Australia, they'd be $AU500 easily. The Skycase is hardly "slimline", but the price is right by comparison. 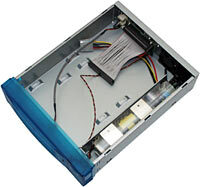 If you're looking for an external IEEE-1394 CD writer solution, though, the Skymaster case might not be a good bet. Readers from Australia or New Zealand can purchase Skymaster products from Aus PC Market.